The circumstances of the economic crisis of the 1990s forced the Cuban leadership to divorce the agricultural model of the previous three decades characterized by large Soviet-style farms, copious petrochemical use, and sugar monoculture, for a far more diverse, direct, and sustainable model that continues to develop today. Within this abstract framework, the phenomena of urban gardens called organoponicos has emerged to serve city dwellers fresh, organic produce, thus elevating food security and improving their diets. Our objective is to enhance the productivity of these urban gardens while maintaining a sustainable practice. In particular, we seek to address protein deficiencies in urban diets with local livestock production, in the form of freshwater fish such as tilapia. This will be accomplished with an aquaponic system that takes advantage of the complementary aspects of plant and animal physiology to grow each in favorable conditions set up by the other. This forms a condensed, controlled ecosystem that will help satisfy the dietary needs of the urban populace efficiently and with negligible negative environmental effects. The infrastructural problem addressed by the contents of this paper cannot be understood without considering the historical context in which it arose. Our solution serves as another step away from monoculture and sensitivity to exogenous economic conditions and toward agricultural autonomy and sustainability. Unstable and insecure agricultural and trade practices in Cuba originated in the years prior to the Castro revolution. During this time, the United States and Cuba had an intimate economic relationship, characterized by favorable tariff reductions and the presence of U.S. companies in most of the Cuban countryside. Cuba’s economy relied on the export of sugar and the import of food and beverages, primarily from the U.S. (Alvarez 15). This economy was very sensitive to international sugar price fluctuations and vicissitudes of other sorts, which caused domestic revenue instability and insecurity (Alvarez 14). Although sugar production and profits fluctuated, it was the most profitable enterprise, preventing the growth of other sectors and agrarian diversification (Alvarez 12). In addition, Cuba’s rural population endured a dismal standard of living characterized by low income, inconsistent employment, high illiteracy, malnourishment, and harmful sanitation levels (Alvarez 20-24). Of its many objectives, the Castro revolution of 1959 intended to return the Cuban countryside to Cuban hands, curb the dependence on sugar, and improve the living conditions of the rural populace. Concretely, it enacted the first and second agrarian reform laws which, in combination, proscribed and nationalized all farms larger than 67 hectares and domineered foreign-owned lands (Alvarez 39-40). Initially there was a movement toward diversification; however, this movement was “technically ill-advised and had to be abandoned” (Koont 14). Cuba then joined the Council for Mutual Economic Assistance, the economic conglomerate of the Soviet Union and its allies, trading sugar, petroleum, and food products (Koont 14). In the decades following the revolution, three important circumstances caused the major reconfiguration of the agricultural sector in the early 1990s and continue to influence contemporary agrarian practices. The first was the diminishing productivity of large, Soviet-style farms owned and operated by the state. Alvarez argues non-state farms were more productive than state farms although the latter had greater access to resources and inputs (54). The second incident was the dismantling of the Soviet Union and the trade agreements with it and its neighboring countries. This caused a dramatic decrease in imports and exports and jolted Cuba into a crisis. Foreign trade dropped by 75%, and from 1989 to 1993, the economy contracted by 35% (Mark 2007). Oil imports from the USSR dropped by 90%; consumer goods, grains, and foodstuff greatly declined; raw materials and spare parts for machinery stopped altogether; fertilizer imports dropped by 80%; and animal feed plummeted by 70% (Perez 2006). Cheap Soviet oil was no longer available, and sources of energy quickly became scarce in a country facing economic collapse. Livestock production and the Cuban diet were also negatively affected. Millions of cattle, hogs and goats died as a result of resource depletion (Mark 2007). In 1989, the average caloric intake was 2900/day and it dropped steeply to 1800/day. Protein consumption also dropped by 40%. Animals that were once considered pets now became targets for consumption (e.g. cats) (Mark 2007). The U.S. then tightened its economic sanctions. Overall, agricultural production fell by 54% in approximately five years (FAS, USDA 2008). The inability to import petroleum and agricultural equipment precluded the perpetuation of Soviet-style farming. Because revenues from sugar exports could no longer offset the cost of importing food, a novel means of producing sustenance had to emerge. Cuba’s inefficiency and misallocation of resources were exposed once the abundance of massive subsidies from the Soviet Union and its allies ended (FAS, USDA 2008). The situation was such that Cuba was forced to abandon the decades-old tradition of monoculture and find a way to sustain itself domestically. Thus, what Fidel Castro called “The Special Period [in a time of peace]” began. New regiments of rationing were instated, industrial plants and factories drastically cut work hours – some stopped working altogether – and 200 consumer goods were added to the ration list to provide substitutes for scarcities in other foods (Perez 2006). Parcels of state farms were leased indefinitely to units called Basic Units of Cooperative Production (UBPC) that purchased inputs independently, were the owners of their product, and could sell amounts beyond a quota in a farmers market (Alvarez, 76) Despite mixed productivity results, the organizational structure that resulted from the implementation of UBPCs set the framework for the urban agricultural movement that has developed since. A lack of resources and food ushered in a great deal of innovation, adaptation, and invention. The Cuban people began to grow their produce everywhere – empty lots, backyards, balconies, and roof-tops. When the government took notice in 1994, the Ministry of Agriculture created an urban agriculture initiative to promote the practice and improve the food security of urban populations. A rampant lack of fuel called for drawing the locations of production closer to the places of consumption, and only organic farming methodologies were implemented (Koont 21). Available spaces near and within cities were converted into raised planting beds called organponicos and their derivatives, which provided the surrounding population with fresh produce and livestock. These innovative approaches were anticipated to fade after the Special Period scarcities ended; however, these methods proved to be so productive, that other countries began to adopt them. In fact, lineamiento number 174, as part of the “lineamientos” by the Cuban government released in 2011, states that “the urban agriculture program … should be extended to the entire country” (Friendman-Rudovsky 2012). The mechanism of the organoponico is as follows: organic matter is taken from rural areas to cities with family housing units; this organic matter is laid into long beds where the plants are placed. Ample sunlight and sustainable crop management allow vegetables, medicinal plants and condiments to grow (Taboulchanas 2001). Over 400,000 people are employed by urban agriculture. For example, the Vivero Alamar cooperative organoponico provides jobs for 163 people (Friedman-Rudovsky 2012). Although it is a greener alternative, it still faces many challenges including soil scarcity, organic matter, arable land, water, natural fertilizer, and volumetric yields. Due to these many difficulties and a struggling Cuban economy, Raul Castro has taken initiatives to give the private sector more power. Cubans are set to move into an “incipient private sector [by] 2015” (Leaders 2012). It is believed that he wishes to adopt an industrial, top-down method. However, this is a pivotal moment for Cuba to adopt a strong, healthy and sustainable method of agricultural production. In this paper we propose the implementation of aquaponics as an innovative method to meet these criteria. Aquaponics is an integrated and symbiotic system of both aquaculture and hydroponics. Aquaculture is fish breeding; in this case, freshwater fish are the primary source (IOW). Hydroponics is a method of plant cultivation in which nutrient-rich solutions are used in place of soil (IOW). Aquaponics enacts both of these farming methods to achieve the symbiotic interaction of plant and animal life. The aquaponic system recirculates the water from the aquaculture portion into hydroponic beds. Most recirculating systems are designed with filters to remove fish effluent and continue the circulation of water. However, in this system, a small volume of water houses massive quantities of fish in tanks and the effluent-filled water is circulated through long hydroponic beds. As the wastewater flows through the beds, the plants absorb small amounts of water and waste as nutrients. The roots of the plants act as biofilters, removing waste from the water which could prove hazardous to the fish if accumulated. Once filtered by the hydroponic beds, the clean freshwater is returned to the fish tanks (Rakocy, Masser 2006). This waste is comprised mainly of ammonia, nitrogen rich gases, magnesium, sulfate, and iron – all of which are nutritious minerals for plant growth (Rakocy, Bailey 2006). The system is composed of four fish rearing tanks, two cylindro-conical clarifiers, four filter tanks, one degasser, six hydroponic beds (tanks), one sump, and one base addition tank. This occupies a total land area of about 0.05 hectares (Rakocy, Bailey 2006). This system, although it yields great results, requires some treatment processes. These include modification through air stone addition (air diffusion without filtration), degassing for methane, CO2, H2S, and nitrogen gas, denitrification filters, solids removal three times a day from a clarifier, and direct nitrification in a hydroponic tank (Rakocy, Bailey 2006). The hydroponic portion of the system requires 13 nutrients for the proper growth of the plants. Ten are supplemented by the fish effluent and the remaining three are supplied in the form of Ca(OH)2, KOH and chelated iron, which are pH regulators. (Rakocy, Bailey 2006). The production of both fish and plants requires optimal management in the areas of feeding, stocking, monitoring environments and staggering the types. Using the UVI system as a model, this includes: feeding three times daily, stocking fish per unit volume, staggering the types of fish on a 24 week cycle and harvesting every 6 weeks (Nile or Red Tilapia), and monitoring the pH balance to a value of approximately 7 to 7.5. The energy consumption of the UVI system is relatively low, resulting in a combined total of 3 HP. (Rakocy, Bailey 2006). Aquaponics owes its growing popularity, in part, to the attractive economic gains that go hand in hand with a proper implementation. Aquaponic crops grow faster and use less land, water, and labor than traditional agriculture. The organic systems also save on fertilizer costs since the introduction of chemical fertilizers could harm the fish-stock. The emerging technology has inspired a wave of entrepreneurs who risk the financial uncertainties and start their own farms. Some argue that this technology works best as a small scale, community level supplement to existing infrastructure, which is how it is often used. The question is whether these emerging farms can be commercially feasible on a larger scale. According to a study done by the UVI, economic potential is present and substantial, but in order to make this a realistic and prosperous agricultural system, hydrodynamic, physiochemical, biological, and technological know-hows are a must (Bailey 2012). 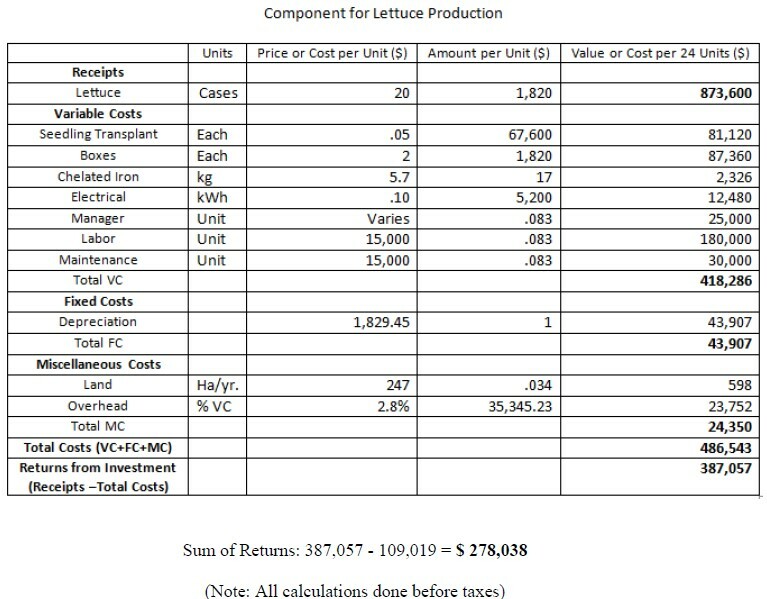 The following case study is an interpretation of the economic analysis conducted by the researchers at UVI, who developed a commercial scale aquaponic system that grows leaf lettuce using red tilapia. Three farm sizes were analyzed, consisting of 6, 12, and 24 production units. Each unit contains the elements illustrated in Figure 1. This paper will address the 24 unit model, as it is the most appropriate for large scale production. The initial investment was made for the development of a lettuce and tilapia production component, storage facilities, office and work space, vehicles, greenhouses, and fish nurseries for hatching and breeding. The operating costs include the variable costs, which depend on the level of production, fixed costs, which was comprised solely of the depreciation per unit, and other miscellaneous costs listed in the chart below. 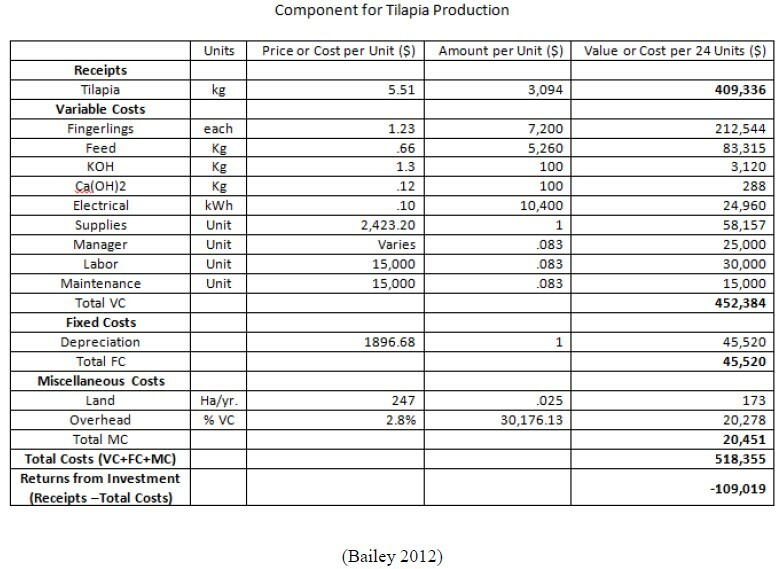 Like the capital cost above, this analysis was split between the tilapia and the lettuce production components of each unit. The managerial, labor, and maintenance personnel of the 24 unit farm had the following breakdown: 1 manager, 18 hired laborers (2 employees for the fish component, and 16 for the lettuce component), and 2 maintenance employees, for a total of 21 workers. The successful translation of this this data to future aquaponic farms in Cuba will depend on the customer demand for the product being sold. In this example, 35 cases of lettuce, at 24 heads per case, were sold each week at a price of $20 per case. For such a demand to exist, Cuba will have to continue expanding its nascent, free market and put the entrepreneurial spirit of its people to good use. The aquaponic system has an exceptionally small negative impact on the environment. The need for large agricultural equipment is diminished, and with it, the systems carbon footprint. An average tractor consumers 11 gallons of gasoline per hour which in turn produces 19 pounds of carbon dioxide per gallon of gas. With the aquaponic system, only a fraction of the machinery is needed so emissions will be very limited. Waste of organic matter is minimal as well, due to the continuous recirculation of the water in the system. The plants’ capability to use dissolved fish waste as fertilizer eliminates the need to replace the water in the system. In addition to minimizing waste and emission, the aquaponic model is energy efficient. According to the UVI case study previously referenced, each unit requires just 2.5 horsepower for the blowers and a 0.5 horsepower water pump. This results in a system that effectively uses 3 horsepower to produce over 500 pounds of tilapia in just a single harvest and up to 18 times as much okra as the traditional field agriculture method. (Rakocy, Bailey 2006). The systtem’s only real detriment to the environment involves an essential degassing process which releases methane, hydrogen sulfide, and nitrogen. These gases form as a result of anaerobic conditions in the sludge which accumulates on the fish tank nettings used to capture particulate fish waste solids. (Rakocy, Bailey 2006). Despite the burdens of a closed socialist economy, Cuba has succeeded, in its own right, at providing basic health care and nutrition for its people. With an average life expectancy of 77.87 years, Cuba rivals some of the wealthiest countries in overall life longevity, including the US’s 78.49 (Nutritional Country Profiles, 2013). According to UNICEF’s Multiple Indicator Cluster Survey (MICS), the prevalence of malnutrition among pre-school age children in Cuba was below 5% in 2000, with the highest prevalence rates (7%) occurring in rural areas of the occident (Perez, 2009). Body mass index information labeled only 9% of adult women and 6% of adult men as “chronically energy deficient (Perez, 2009).” These figures are at the forefront of developing countries. Yet, despite its success in curbing hunger with government sponsored projects like the rationing system, nutrition is lagging at a time when economic and cultural transformations are bringing change at an accelerated pace. A major contributor to the nutritional deficiencies in Cuba is its culture of unhealthy eating habits. Part of this culture includes unhealthy energy distributions, low vegetable, fruit, and whole grain intake, low fish consumption, and a preference for sugary or fried foods. In 2001, a nationwide survey was conducted to ascertain the gastronomic preferences of the general Cuban public; the results are perhaps the best explanation for the country’s “rising obesity rates, iron-deficiency anemia, and escalating cases of hypertension, cardiovascular diseases, and diabetes (Perez, 2009).” Some of the most common answers to the survey, which asked the average Cuban what he/she would choose to consume on a daily basis, were “a ham and cheese sandwich, fried chicken and pork rinds, white rice, white bread, few leafy greens, and soft drinks with every meal (Gorry, 2009).” As is the case with many developing, middle-income nations, Cuba has progressively adopted a diet rich in fats and sugar, and a sedentary lifestyle. From the data, the summation of Cuban staples is decidedly nutrient rich, but there are deficits to be accounted for. For example, while traditional Cuban foods are high in Vitamin B6, they are low in a good deal of the remaining members of the vitamin B complex, including B12. Low levels of B1, B6, and B12, coupled with a low vitamin E intake (supported by the data) and aggressive tobacco use, were responsible for the incidence of the Cuban neuropathy epidemic of 1991-1994, which has since then been remedied by vitamin supplementation. More recently, Cuba began to enrich flour with iron as an effective and inexpensive way of alleviating deficiencies in the mineral, which has led to outbreaks of anemia throughout the island. In addition, experts point to a lack of information about the dangers of being overweight, which leads to underestimation of the consequences; a problem they aim to solve through education initiatives. (Bailey 2012). The most widespread micronutrient deficit in Cuba is iron deficiency, particularly in the eastern provinces of Guantanamo, Santiago de Cuba, Holguin, Granma, Las Tunas, and Pinar del Rio in the west. The lack of iron enriched products and lack of consumption of iron rich foods is the cause for the regional trend of anemia incidences prevalent in these provinces. It affects mostly children under the age of two, and young women who are of reproductive age or pregnant. In fact, “30-45% of infants aged 6 to 23 month, 25-35% of young women, and 24% of pregnant women in their third trimesters have anemia. (Perez, 2009)” A conglomerate of ministries, including the Ministry of the Food Industry, Ministry of Agriculture, and Ministry of Domestic Trade, is working to fortify food and provide iron supplements, as well as increase accessibility in the provinces that need it most. In 2009, the United Nations agreed to allocate 8.5 million dollars to help in this effort for a period of three years. A principle objective of the plan is to curve anemia by working with municipal level maternity homes, which treat women with high risk pregnancies. A conundrum of the Cuban nutritional reality is that despite the shortages in food, there is an increasing trend in the number of overweight and obese individuals, another serious health issue. Between the years 1993 and 1998, the prevalence of obesity, which was on the rise during the 1980’s, stabilized at around 5%, but has been increasing ever since. Between 1995 and 2001, the percent of overweight individuals rose by 10.6%, increasing the overweight population of the island to just under 43% (Perez, 2009). Women tend to be more overweight than men and report higher levels of obesity, with a staggering 15.4% and 7.9%, respectively, reporting obesity in 2001. In addition 45% of those who are overweight or obese accumulate the excess weight as abdominal fat, which puts them at a high risk for many chronic diseases, of which heart disease, cancer, and stroke are the most rampant. All three are very much influenced by diet. Increase percentage of Cubans who eat 2 serving of fruit daily to 40%, and those who consume 3 serving of vegetables daily to 50%. Increase percentage of Cubans whose fat consumption is 20-30% of total calories to 45% of the population. Decrease the number of Cubans who do not add salt to their meal to 95% of the population. Increase the number of Cubans who are within the normal BMI range to 65% for adult men and 56% adult women. Reduce obesity to 4% for adult men and 10% for adult women. Reduce the incidence of anemia to 15% for children less than 2 years of age, 19% in for women of reproductive age, and 15% for pregnant women (Perez 2009). One of the substantial benefits of the aquaponics system is the symbiosis between fish and vegetables, which allows for the harvesting of relatively healthy protein sources missing in a diet rich in red meats and poultry. What’s more, the high vitamin and mineral values of plants like spinach, pak-choi, and watercress make this water and space-efficient technology a valuable addition to the agricultural infrastructure in Cuba. Our largest concern and our main objective for this infrastructure analysis and proposal are to implement the aquaponic system in Cuba and in turn provide the citizens with a large quantity of quality food which can be produced simply and efficiently. In order to turn this idea into a reality we must hone in on the most effective method of implementation on the island. Therefore, we propose what we will call “An Engineered Trickle Down”. It revolves around the basis that we first propose the aquaponic system to an area which has the energy resources, the funding, and the people to create and maintain it. The initial implementation location of this system would be an area well populated with tourist attractions. We believe this is a practical and realistic implementation approach because these areas would profit greatly from the aquaponic system by selling meals to the tourists consisting of the fish and vegetables produced. In addition, it could serve as a tourist attraction. Given our objective is to take a humble step towards increasing the autonomy and sustainability of the Cuban agricultural model and improve the food security and health of the ordinary Cuban citizen, serving tourists with the yields of our aquaponic system seems irrational. However, there is a process by which this asset can perfuse into Cuba’s smaller cities where a substantial portion of the population may benefit. A portion of the profits made through this activity can be invested in improving the power structure of small towns in the surrounding area in preparation for the implementation of our aquaponic system. If it is incorporated into a cooperative near the tourist location, individuals from neighboring towns may work with the system and use the technical knowledge and manual experience gained to possibly construct and operate a similar system nearer to their homes. Because of the consistent power available in tourist locations, these will effectively serve as experimental grounds for the system where design errors can be fixed and improvement can be made. Thus, a system more fit for the neighboring towns can evolve from our own. The economic contraction of the early 1990s caused enduring deficiencies in the Cuban diet and diminished the food security of the average Cuban citizen. The initiative of these citizens, reinforced by government policy, generated an urban agricultural movement designed to improve produce availability in a sustainable fashion. Despite these efforts, a shortage of essential nutrients remains. Our proposition improves the productivity of urban gardens while maintaining a sustainable practice through an aquaponic system that creates a regulated symbiosis between vegetation and livestock to increase agrarian output. This system will not only add critical nutrients to the Cuban diet without harmful environmental effects, but it could also serve as a source of hard currency and jobs if the prescribed implementation is considered. Our innovative model, and the benefits it can generate, could also be appropriated by other countries looking to address similar problems through sustainable means. “About CSA.” Center for Sustainable Aquaponics RSS. Center for Sustainable Aquaponics, Mar. 2012. Web. 20 Jan. 2013. <http://centerforaquaponics.com/>. Bailey, Donald. 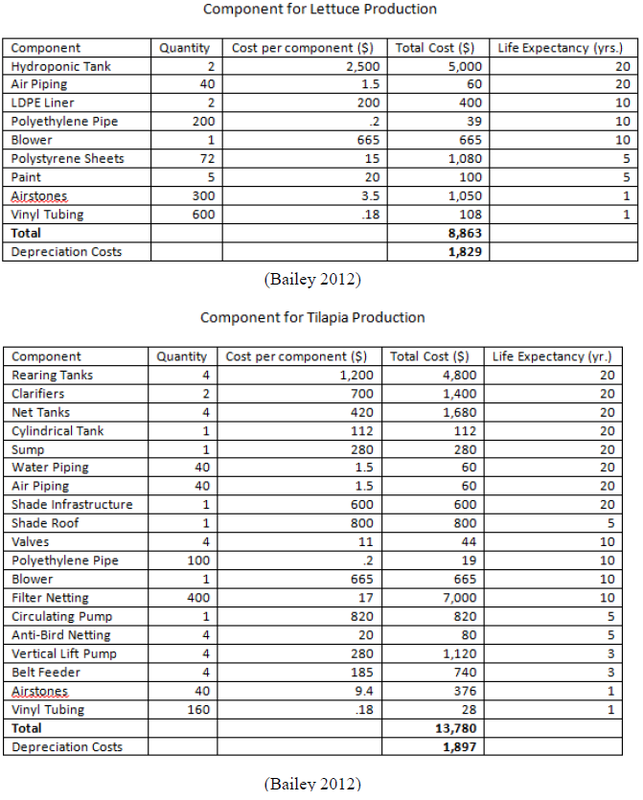 Economic Analysis Of A Commercial-Scale Aquaponic System For The Production Of Tilapia And Lettuce. Diss. University of the Virgin Islands, Print. <http://aquaponicsglobal.com/wp-content/uploads/2012/02/Economic-Analysis-of-a-Commercial-Scale-Aquaponic-System.pdf>. “Cuba Economic Situation.” Food and Agriculture Organization of the United States (2013): n.pag. Web. 25 Jan 2013. <http://www.fao.org/countryprofiles/index/en/?subj=3&lang=EN&iso3=cub>. Friedman-Rudovsky, Noah. “Urban Agriculture in Cuba (Photo Essay) | North American Congress on Latin America.” North American Congress on Latin America. NACLA, 18 Oct. 2012. Web. 20 Jan. 2013. <https://nacla.org/news/2012/10/18/urban-agriculture-cuba-photo-essay>. IOW. “What Is Aquaponics?” Aquaponics How To. IOW. Web. 20 Jan. 2013. <http://www.aquaponicshowto.com/what-is-aquaponics/page/20/>. Koont, Sinan. Sustainable Urban Agriculture in Cuba. Gainesville, FL: University Press of Florida, 2011. Print. Leaders. “On The Road Towards Capitalism.” The Economist. The Economist: Print Edition, 24 Mar. 2012. Web. 20 Jan. 2013. Mark, Jason. “Growing It Alone: Urban Organic Agriculture in Cuba.” Earth Island Journal. Earth Island Institute, Mar.-Apr. 2007. Web. 19 Jan. 2013. “Mission 2014: feeding the world.” Massachusetts Institue of Technology. N.p.. Web. 25 Jan 2013. <http://12.000.scripts.mit.edu/mission2014/solutions/aquaponics>. “Neuromuscular.” VITAMIN, MINERAL & NUTRITION RELATED SYNDROMES. N.p., 11 1 2013 . Web. 25 Jan 2013. 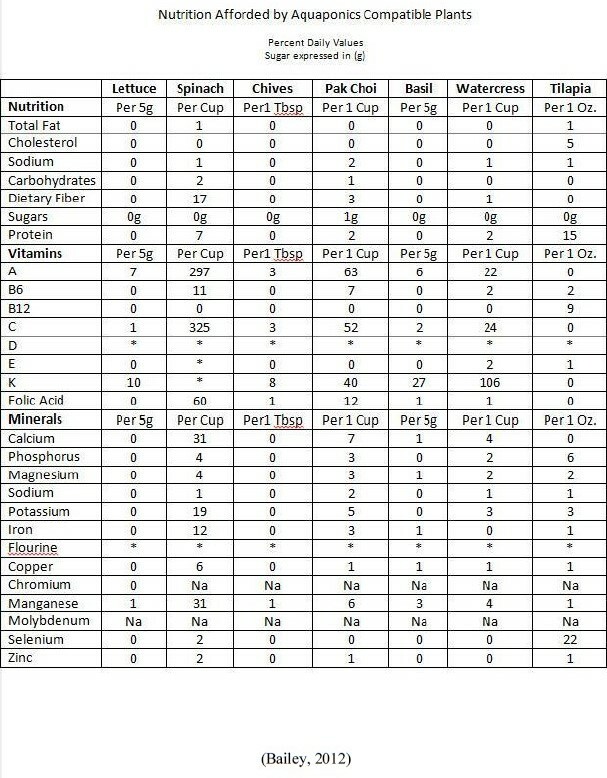 <http://neuromuscular.wustl.edu/nother/vitamin.htm>. “Nutrition Country Profiles.” Cuba summary (2010): n.pag.Agriculture and Consumer Protection Department. Web. 25 Jan 2013. <http://www.fao.org/ag/agn/nutrition/cub_en.stm>. ORGANIZACION DE LAS NACIONES UNIDAS PARA LA AGRICULTURA Y LA ALIMENTACION. FAO – PERFILES NUTRICIONALES POR PAISES: Cuba. Rep. 2003. Print. Perez, Louis A., Jr. “An Excerpt From: “Cuba: Between Reform & Revolution”” History of Cuba. J.A. Sierra, 2006. Web. 19 Jan. 2013. Perez, Raul. “The Public Health Sector and Nutrition in Cuba.” MEDICC Review. 11.4 (2009): 6-8. Web. 25 Jan. 2013. <http://www.medicc.org/mediccreview/articles/mr_113.pdf>. Rakocy, James E., Donald Bailey, Charlie Schultz, and Eric Thoman. Update on Tilapia and Vegetable Production in the UVI Aquaponic System. Rep. St. Croix: University of the Virgin Islands Agricultural Experiment Station, 2006. Print. Rakocy, James E., Michael P. Masser, and Thomas M. Losordo. 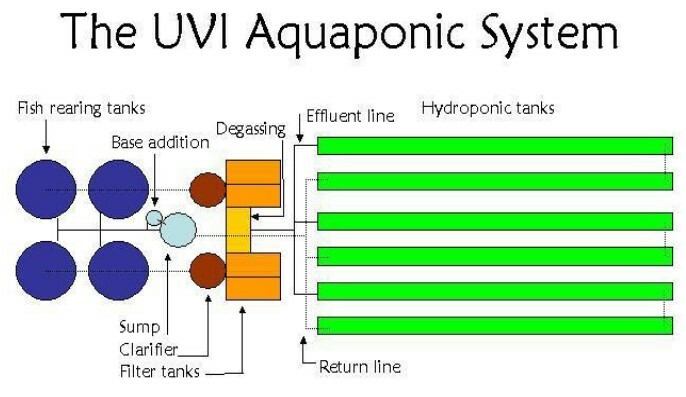 Recirculating Aquaculture Tank Production Systems: Aquaponics—Integrating Fish and Plant Culture. SRAC Fact Sheets. SRAC, Nov. 2006. Web. 19 Jan. 2013. Talbouchanas, Kristina H. Organic Status and Dietary Role of Organoponicos in Cienfuegos, Cuba. Websites & Web Documents. David G. Patriquin, 12 Apr. 2001. Web. 19 Jan. 2013. United States. FAS & USDA. Office of Global Analysis. Cuba’s Food & Agriculture Situation Report. Print. Virgin Islands Water Resources Research Institute. Virgin Islands Water Resources Research Institute Annual Technical Report. Rep. no. FY 2011. 2011 ed. St. Croix: Virgin Islands Water Resources Research Institute Annual, 2011. Print. FY. Winkler, Sarah. “HowStuffWorks “How Aquaponics Works”” HowStuffWorks “Home and Garden” HowStuffWorks, 22 Dec. 2008. Web. 19 Jan. 2013. <http://home.howstuffworks.com/lawn-garden/professional-landscaping/alternative-methods/aquaponics.htm>.